Passengers are welcome to board our ship at 6:00 p.m. After comfortably settling into your cabins, we’ll introduce our crew at a welcome cocktail. Sit back and enjoy a presentation about your CroisiBike vacation. This morning, your bike trip will follow the curves of the Loire River. You’ll pass under verdant canopies in magnificent forests and enjoy the peacefulness of the river. Your countryside journey will take you to Saint-Etienne-de-Montluc and around Lavau-sur-Loire. We’ll enjoy a picnic lunch. In the afternoon, you’ll jump back on your bike and continue to follow the river. In the southern-most part of the Loire, you’ll discover sumptuous and varied landscapes. At the end of the day, you’ll arrive in the old port city of Saint-Nazaire on the Atlantic coast. Take a tour of the shipyard museum before returning to the ship. 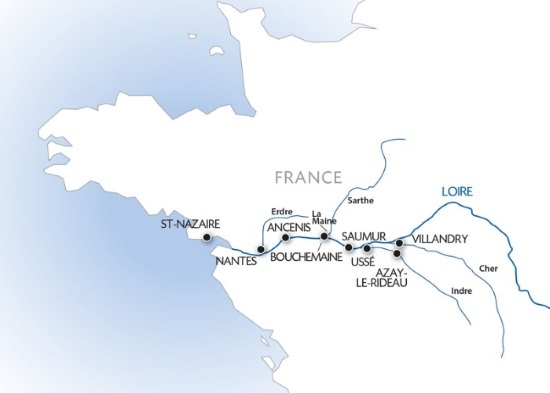 Bike itineraries: to Lavau-sur-Loire 17 mi./27.4 km. (400 ft./122 m. elevation gain) - to Saint-Nazaire 35 mi./56.3 km. (600 ft./183 m. elevation gain) - from Nantes to Saint-Nazaire: 45 mi./70.8 km. (100 ft./305 m. elevation gain). Bike itinerary: to La Baule 8 mi./12.9 km. (200 ft./61 m. elevation gain) — to the salt marshes 21 mi./33.8 km. (600 ft./183 m. elevation gain). Bike itinerary: to Oudon 19 mi./30.6 km. (698 ft./213 m. elevation gain) — to Ancenis 25 mi./40.2 km. (801 ft./244 m. elevation gain). We’ll take a minivan to the starting point of today’s journey into the heart of the Loire Valley, passing in front of the most beautiful castles in the world. Take some time to stop at the Château de Villandry. Once owned by Napoléon Bonaparte, this majestic palace includes what many consider to be the most stunning gardens ever conceived. The water garden and decorative flower garden are not to be missed. Then you’ll get back on your bikes for a pleasant trip to the Château d’Azay-le-Rideau, one of the oldest Renaissance castles in France. We’ll enjoy a picnic lunch. Spend the afternoon touring the Château d’Azay-le-Rideau on your own. Your journey for today will finish up with a glimpse of vineyards and troglodyte homes before you arrive at your final destination, Saumur. You’ll return to the ship in Bouchemaine and enjoy an evening of dancing. Bike itineraries: to Villandry 16 mi./25.7 km (600 ft./183 m. elevation gain) to Rigny-Ussé 39 mi./62.8 km (1401 ft./427 m. elevation gain) - to Saumur 43 mi./69.2 km (1499 ft./457 m. elevation gain). Bike itineraries: to Thouarcé 21 mi./33.8 km (699 ft./213 m. elevation gain) - to Bouchemaine 39 mi./62.8 km (1299 ft./396 elevation gain) - to Rochefort-sur-Loire 31 mi./72.4 km. (1400 ft./457 m. elevation gain).